DPM 2000 dental chair foundation and structure are made up of solid cast iron with anticorrosive treatment with high impact polystyrene coding. The headrest is anatomicall double-articulated to accommodate pattients of different hrights, removable and reversible for patients in wheelchairs. The footcontroller commands the up and down chair movements and its support system, reset, emergency stop, automatic switch off overhead light. Available in 16 diffrerent colors! Cuspidor, Ceramic bowl with filter solids collector. Bowl and cup filler are removable and autoclavable. Automatic pneumatic ejector with built-in filter for easy cleaning. Cup filler with the touch of a button. Light comes with two light intensities: 15,000 and 22,000 lux, Easy Bi-Pin lamp replacement. Removable front protector.On and off foot control system. Instrument tray equipped with 2 automatic pneumatic outputs and 3-way detachable syringe. Built in pressurized water system. Progressive pneumatic foot control pedal. Independent air and water control at each outlet. Pressure gauge.Stainless steel tray. DPM 2000 Dp-C2000HU Dental Operatory Chair, Comes with Doctor and Assistant Stool. out of 5 based on ratings. 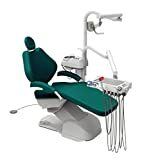 DPM USA CORP. DPM 2000 Dp-C2000HU Dental Operatory Chair, Comes with Doctor and Assistant Stool.